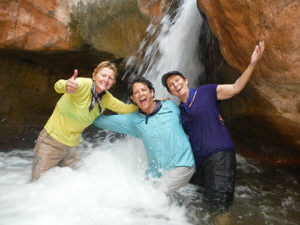 Happy, smiling, waterfall, friends… what’s not to like? You’ve waited with bated breath for our 2018 schedule to come out and now you’ve got your wish! We’re happy to announce the 2018 season is officially open for booking. If you’ve got your heart set on a particular date (Hello, June and September trips!) or a particular trip type (Hiker’s Special, anyone? ), you’d better get in quick! We’ve made a few adjustments to the 2018 schedule; primarily, we are running more 7 Day Motor trips and a few less Hike In/Hike Out trips. We have seen that people absolutely love those 7-day Lee’s Ferry to Whitmore Wash trips with the helicopter ride out of the Canyon, so we bumped up the number of those trips we’re offering. If, however, your dream vacation involves hiking into or out of Grand Canyon, take a look at those Hike In and Hike Out trips and snag an available launch date while they last. So check out the website and give us a ring to book or to answer questions. And don’t forget, we’ve still got a few trips left in 2017 — so, if you want to get down on the mighty ol’ river sooner than later, take a look at our 2017 calendar as well! Here’s to an awesome 2018 season!